Alfred Goh often gets nightmares about passers-by staring at him. For the main door of the two-room Lengkok Bahru flat where the nine-year-old lives with his mother and two sisters is usually left open for ventilation. To set the boy at ease, the family put up a brown cloth over their door grilles for privacy, but poked holes in it to allow some air through. The door set-up in Alfred's home, complete with the cloth, door frame and unit number, has been replicated and is on show at the National Museum as part of an art exhibition that gets less privileged or special needs children to interpret their childhood. It is the first time the museum is displaying artwork from children with special needs. Ms Jean Loo, 33, co-founder of Superhero Me, a community arts movement behind the exhibition, said that while most children here are cushioned from poverty and strife, some are affected by issues such as single parenthood, family violence and the struggle of non-citizen parents to integrate. The movement aims to give children from such backgrounds access to the arts through its programmes. "Through the arts, we hope these children are empowered to self-advocate, embark on a journey of self-discovery and build resilience," said Ms Loo. Alfred's main artwork is, however, not the door frame, but a series of photos documenting his two homes - here and in China. Alfred would return to his home in Guangdong two to three times a year during the school holidays. He was born in China and struggles with English in school. His mother is from China and divorced from his Singaporean father. She works long hours as a beautician to support her four children. Her youngest, a son, three, lives with her sister. The children have so much potential, but they often don't have as many opportunities as typically-developing peers or those with financial means. MS JEAN LOO, co-founder of Superhero Me, a community arts movement behind the exhibition. Superhero Me paired Alfred with former Lianhe Zaobao photojournalist Bob Lee and they visited Alfred's home in China last month to capture images of his life there. Mr Lee could relate to the boy as he had two homes too - he grew up in Johor Bahru but lives here now. Alfred's Guangdong home is an electrical substation built into the slope of a hill and beside an expressway. His aunt and uncle are the substation's caretakers and their living quarters are next to a generator. There, Mr Lee taught photography techniques to Alfred, who initially took photos perfunctorily and shied away from being in the frame. 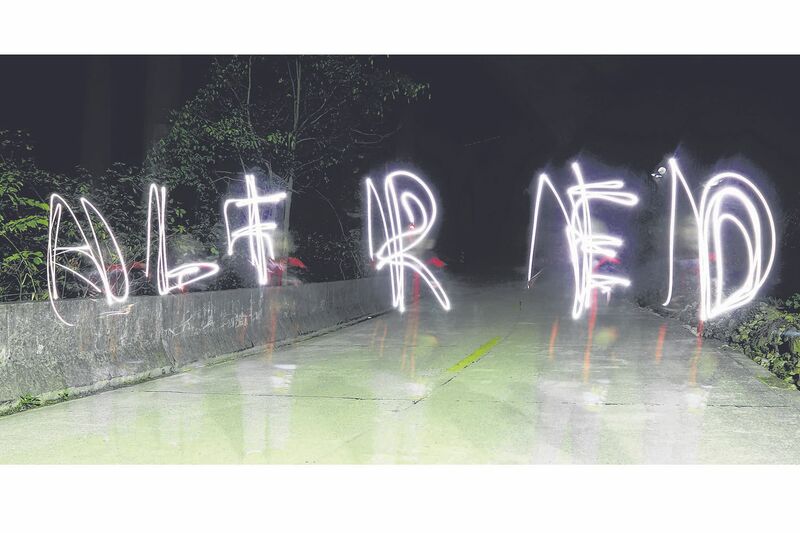 Mr Lee persevered and taught him how to do light painting in the dark outdoors. Long-exposure shots were set up to capture light as Alfred waved a mobile phone about to "draw" the letters of his name. The letters of Alfred’s name “drawn” by the nine-year-old using light from a cellphone in the dark outside his Guangdong home. The boy was so intrigued he wrote his name in the air, over and over again, in the freezing cold. Back in Singapore, Mr Lee broke through Alfred's hesitation in photographing his flat by showing him visual effects he could create by capturing himself in the mirror or swivelling the camera to present the living room in a circular orb. Alfred said he has learnt how photography can enable one to see things differently. "At first, I thought things were not nice, and very normal. But after I took the photos, I realise that they are very nice from different angles," he said shyly. His photos are displayed on yellow window frames in the museum, a replica of the windows found in his home in China. Alfred has grown more confident and is also prouder of his home here. Last Wednesday, he "supervised" the setting up of the exhibition, correcting the wrong placement of the door unit number. The exhibition carries artworks from five other children, including Rinn Chan, five, whose installation features a bed, a slide and over 100 drawings of a character, Emma. Every day after pre-school, Rinn, who has autism, would do up five to 15 drawings of Emma doing things such as baking. When asked why Emma has a huge head and a tiny body, she replied simply: "Because she's Emma and she's like that." Ms Loo hopes the art by children like Alfred and Rinn can change mindsets and encourage more people to accept and interact with them. She said: "The children have so much potential, but they often don't have as many opportunities as typically-developing peers or those with financial means." •The exhibition, Is Anyone Home?, is part of Singapore Art Week 2018 and will run till the end of the month at the National Museum.